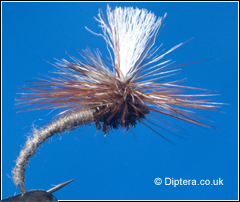 The klinkhămer is an excellent all-round dry fly. The parachute creates a wonderful silhouette on the water and the abdomen sits in the surface film. Usually can produce more takes than a fly sitting on the surface.